If you need to use human shampoo once out of desperation because you don’t have anything else, it’s not going to be a disaster. If you use human shampoo on a regular basis for bathing you dog, you will cause problems. Let’s look at the reasons why. Can You Use Shampoo on Dogs? What are the Consequences? This Dog Shower Wand is great for washing your furry friends. Check Today’s Price Here. It attaches to a shower inside or a hose outside (different attachments included). You will cause your dog to suffer through skin irritations and itches from using the wrong shampoo for dogs. When considering the acidic/alkaline balance of skin, human skin tends to be more acidic and dog skin tends to be more alkaline. This is the reason human shampoo does not suit dogs. So, when you’re asking, can you use shampoo on dogs, the answer is yes and no for different reasons. Sure, the human shampoo will remove the dirt and make your dog cleaner, but your dog may suffer from dry irritated skin as a result. If the skin’s balance is disrupted on a dog it can allow parasites and bacteria to thrive. If the skin becomes dry due to using the wrong shampoo then your dog’s skin will itch and you’ll see your dog scratching and doing damage to their skin. This can let bacteria in and infection may result. Once you learn how to choose a dog shampoo that best suits your fur baby, you’ll not only save money, you’ll have a healthier dog and see a much shinier coat too. What Can I Use to Wash My Dog? Can I use shampoo on dogs to save money? Try one bottle of this natural oatmeal shampoo for dogs and you’ll want to keep using it. Some dog owners look for a good value dog shampoo without considering the consequences it may have later. If your dog is in good health you should try to keep him or her itch-free and happy. And if your dog already has some itches, it’s time to find the right organic dog shampoo to give your fur baby relief. Part of being a responsible dog owner is ensuring that your pets are clean and healthy. You should wash your dog regularly. This is one of the easiest ways you can make sure your dog is well-groomed. Washing is the best place to start. Choose a dog shampoo that is suitable and your dog will be happy. 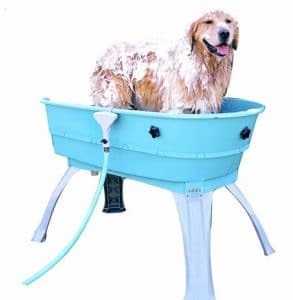 This Booster Bath for Dogs saves you leaning down to the bath tub to wash your dog (check the current price here). It also stops your bath drain getting clogged with fur. And you don’t need to clean your bathroom as much. This dog bath can be used outside, inside, on a deck, in the basement, wherever suits you. And you’ll want the steps for it too (see more detail on the steps here). It’s important not to bathe too often. It depends on your dog’s lifestyle and breed. Each breed has a different type of fur, in length and style, and this often determines how often they need a bath. Not washing your dog will lead to your pet getting fleas, having an unpleasant odor, and discomfort. You should wash your dog monthly, but don’t treat it as a chore. If you do it right, washing your dog builds the bond between you and your dog. You should start when he or she is a puppy to get used to the idea of a bath. Regular dog baths can also benefit you by having less dirt and fewer allergens in the house. Allergens can be carried in from outside or can be picked up from the floor. With so many choices available, it can be difficult knowing how to choose a dog shampoo to even start giving your pooch a bath. If your dog needs to be washed more often you may want to consider rinsing him or her down with clean water only. This way you’re just rinsing off the dirt without actually cleaning the skin. My dog hates baths, what can I do? You may be wondering, can you use shampoo on dogs? But really, you’ve got a bigger problem. Your dog hates bath time! If your dog suffers from anxiety, it’s almost guaranteed your dog will hate baths at first. Until you condition him to know that it is a happy bonding experience, you’ll struggle to get him to come to the bath. If your dog is anxious you’ll know about it. Your dog will possibly cower, dribble, shake, run away, or act in a strange way. He might also bark excessively. And he’ll certainly have his tail underneath him. You can help your dog to deal with anxiety by using a supplement. This all-natural dog supplement for anxiety is very popular because dog parents see great results in their dogs after taking it. Click on the link and read some of the reviews to see what people think about it. If your dog is anxious about bath time, try a calming supplement and see if it makes a difference. You can also use a supplement like Zesty Paws Calming Bites for other high anxiety situations like thunderstorms, loud events like Halloween with people coming to the door, fireworks, or visits to busy noisy places. So it’s good value. What if my pet is a puppy? Can you use shampoo on dogs if you have a puppy? What about baby shampoo? This is a puppy shampoo for dogs over 12 weeks old. Click the link to see reviews and the price. Puppies have skin that is even more sensitive than fully grown dogs. So, can you use shampoo on dogs that are very young? No, you shouldn’t use human shampoo on puppies. If you have to use any human shampoo at all then baby shampoo would be better than other shampoos because it contains fewer fragrances and artificial ingredients. But really, you should not use baby shampoo for your puppy. This is because it is made for human skin, not puppy skin. You need a dog shampoo with the correct ingredients for your puppy. When your dog is still a puppy, it’s also very important that you stay away from artificial ingredients in dog shampoo. While it’s best to stay away from those ingredients for all dogs, puppy shampoos with artificial ingredients are actually less harsh than the ones for fully grown dogs. Knowing how to choose a dog shampoo with fewer chemicals can work for some dog owners. So, if you must use the shampoos with artificial ingredients, use puppy-specific shampoo. No matter how old your dog is, artificial ingredients and chemicals can cause itching, dry skin, and even hair loss. Puppies are much more susceptible to these side effects, because their skin is more sensitive than that of adult dogs. Instead, opt for shampoos that use natural ingredients. Can You Use Shampoo on Dogs if it’s Organic? What does “certified organic” mean? This means that the USDA has certified that all ingredients in the shampoo are grown on a farm that doesn’t use chemicals to grow their ingredients. So, when you’re asking the question Can You Use Shampoo on Dogs, the answer is to use organic dog shampoo whenever possible. You don’t need to spend a lot to use organic dog shampoo. You wash your dog about once a month. At this rate you only need about one bottle of organic shampoo per year. Even though organic is a little bit more expensive, you only spend on it once a year. This is usually quite affordable for most dog parents. When trying to work out how to choose a dog shampoo, it’s good to know certified organic ones are almost guaranteed not to cause your dog any itching or skin problems. Organic shampoos can be used on dogs of all ages, from puppies to older dogs. Organic shampoos mostly use natural fragrances or essential oils, such as honey and lavender, to make sure your dog smells fresh after a bath. Time to get rid of that wet dog smell. 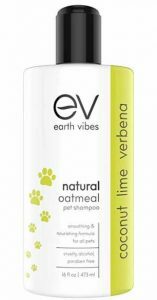 Best dog shampoo for my dog? First work out what your priority is for your dog. Do you want to reduce shedding inside the house? Do you want to cure dry skin? Is itchy skin a problem for your dog? Once you know your priority, this will help you determine how to choose a dog shampoo that will work for you and your pooch. 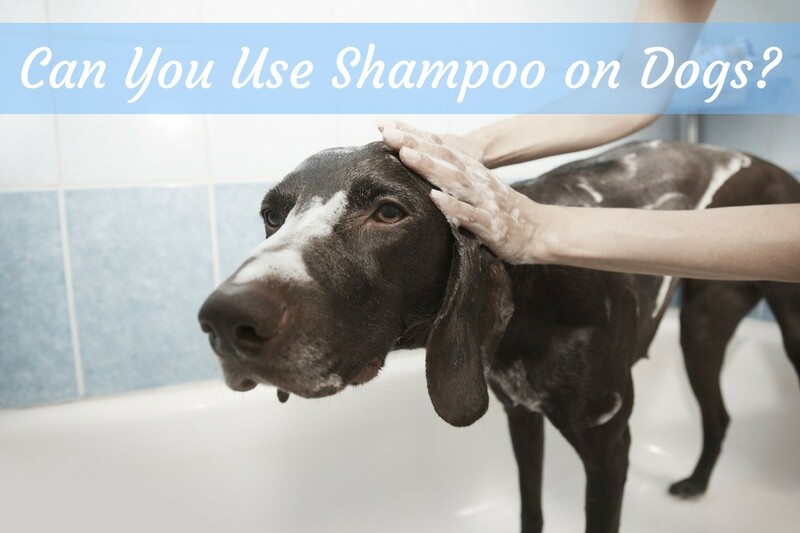 There are plenty of different kinds of dog shampoo for every situation. Some shampoos help with excessive shedding, while others are made with aloe vera or rosemary to help with dry skin. You can also get shampoos to help get rid of fleas or cure skin conditions. Some can be useful in treating mange and similar parasitic infections. There are organic dog shampoos for almost every problem your dog might have. It’s important that you begin washing your puppy from an early age. They might be scared at first, but with some coaxing and some extra treats, you’ll get them to love it. After a few months of fun baths, they’ll be excited to have a bath just like they would be happy to go on a walk or get a treat. So, can you use shampoo on dogs? The answer is yes as long as it is dog shampoo. Don’t use human shampoo if at all possible to avoid. And show some love towards your dog by getting natural organic shampoo to keep your dog healthy and itch-free. ⇒ Need to get rid of matted dog hair? Learn how, here.